The West Point Association of Graduates (WPAOG) is the publisher of West Point magazine and First Call eNewsletter. Founded in 1869, WPAOG is a non-profit, tax-exempt corporation dedicated to furthering the ideals and promoting the welfare of West Point, and to serving and supporting the “Long Gray Line” of more than 55,000 living West Point graduates. Its philanthropic pursuits maintain a Margin of Excellence for cadets attending the United States Military Academy. West Point magazine is the official alumni magazine of the United States Military Academy at West Point, the world’s premier leader-development institution, ranked as the #1 Top Public School in the U.S. News & World Report. 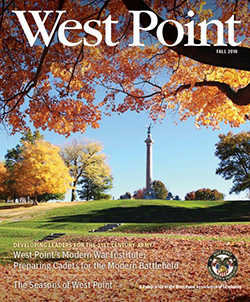 View Current West Point Print & Digital Media Kit. This special section within West Point magazine is designed to showcase West Point graduate and faculty authors, as well as selected books about West Point. View West Point Bookshelf rates. First Call, WPAOG’s eNewsletter for all West Point graduates, is issued twice a month. This digest of Academy, graduate and cadet-related news content and photography is curated for maximum interest to graduates. It regularly achieves an outstanding open rate of over 36%. *Dates are subject to change. Printed wraps must be provided 8 weeks prior to print deadline. This quarterly magazine is mailed free of charge to all living graduates, current cadet parents and widowed spouses. West Point offers fresh content focusing not only on the Military Academy of today, but also highlighting the 200-year-old traditions that unite all members of the Long Gray Line. In addition to the print edition, a digital edition is also offered online. View past issues of West Point magazine.